Cashel Rock turned three and that is BIG. He had a few requests for his birthday and this party is what came from those requests. This time around I vowed to make the party about him and his interests. I had fun planning details I knew he’d enjoy and found some of the most fun ROCK activities and treats. I just had to share. I used searches for construction digs, hiking parties, and also geology themed parties and luckily I found some things that got my brain going! At first I found it hard to find ROCK (like the stone kind of rock and not rock and roll kinds of) party ideas. Then I hit my stride. And realized it doesn’t take much! I got the rock cookie recipe here and on my second batch I upped the butter from 3/4 cup to 1 cup because I wanted them a bit more moist (recipe is also at the end of this post). 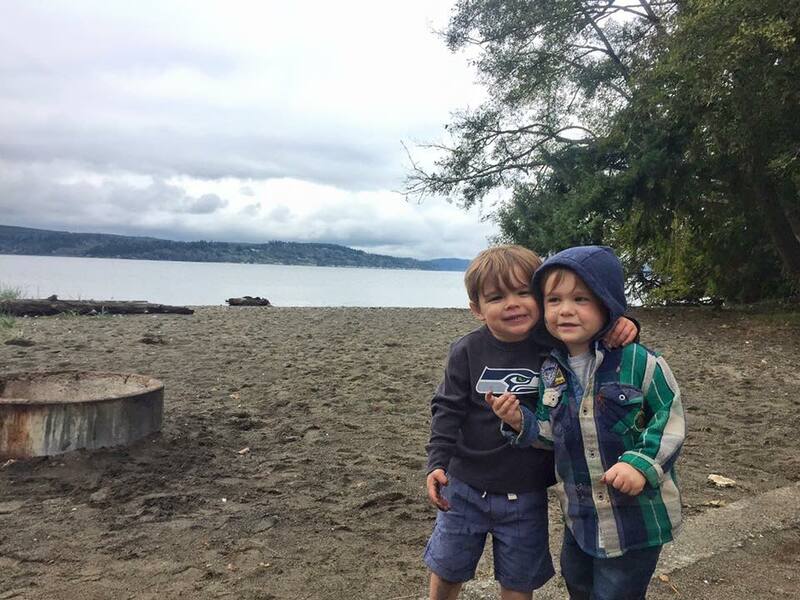 They were the perfect treat on this very cool Pacific Northwest day – especially since our friend brought coffee, tea, and hot cocoa for the adults! YUM! Thank you Michelle! The kids got to take home “YOU ROCK! 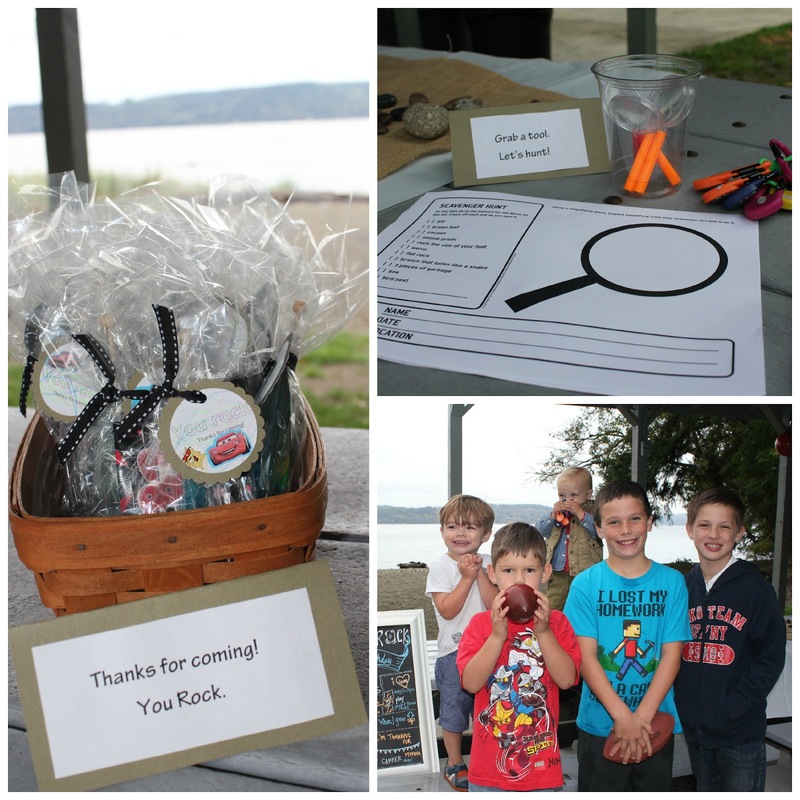 Thanks for coming.” favors that contained pop rocks, a rock candy lollipop and a rock bouncy ball – again I found those ideas on a geology themed post from “Kara’s Party Ideas.” (and purchased on Amazon). I chose these items as a way to say thanks to our beloved guests and because we could do them on our budget. Cashel colored and put the stickers on each tag – all himself. I was very proud, and so was he, when he got to give them to his guests as they left. Dirt cups were a hit. I made the pudding and crushed oreos ahead. All the ingredients were in disposable gallon Ziploc bags so I could squeeze them into the cups easily on site, or let the bigger boys do it themselves. Our Cashel has mostly had friends (boys that is) that are older then him, save his cousin Cooper. Until recently when a new friend came into the picture! That being said I invited boys of all ages, that are important to our Cashel Man, and it was wonderful. I can’t tell you how special these big boys are to make Cashel feel loved on his birthday and to show and teach him to be an awesome boy. Thanks to their parents for raising such awesome boys for Cashel to look up to and learn from. We love you. Then the boys painted rocks. Cashel hunted for these the whole week leading up to his party and collected them in a basket. (There is the cutest picture of this on my “Inspiration Clothesline” Instagram account if you want to hop over there!) Collecting the rocks really helped him feel apart and built anticipation. He was so excited to see the boys pick a rock to paint and surprisingly they all SAT down and painted to their hearts content. I loved how their ages and personalities shown through. Treasure rocks were perfect for all ages. I found two recipes online and worked with both to make mine. My only error was adding all the water at once so the dough was WAY too sticky. Next time I’d add water slowly until it was like playdough. I had to almost double the flour and bake much longer, like MUCH longer and after flipping half way even longer still. But in the end the boys ALL loved cracking them open and finding “treasures” inside. They included marbles, metal bells, coins, & shells – just items we had around. I couldn’t believe how excited they ALL got over this activity. And since my batch was so large they each got to crack open at least 4 each. So fun! This really was so much for kids of all ages – the dads even liked it too! I love having this chalkboard tradition (you can see the last two years boards by liking Inspiration Clothesline on Facebook) as it is a chance for me to check in with the birthday boy, see what has changed for him, and what stays the same. We also have fun, just us parents, predicting what he might say. It hangs framed in his room year round and is just a beautiful memento for the year to remind us of who he is. And this year a friend gifted me this awesome new-to-me chalk board! Thank you Maggie. The beach and this spot couldn’t have been better. Even the drizzle we had seemed fitting. You’ll notice Cashel’s outfit changes – several times – very true to form. He was wet to his arm pits within minutes of arriving and all I had in my backup bag was shorts. Got to love it. He eventually lost the shoes too and later even his t-shirt (which was covered in paint) in exchange for a Seahawks shirt he was given at the party! 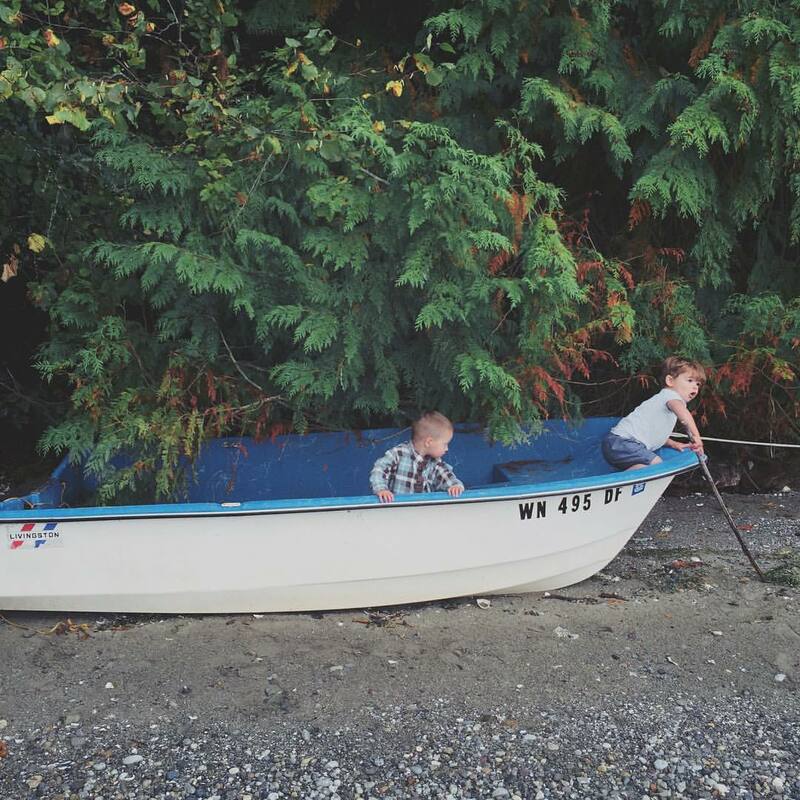 Oh my little man – the consummate adventurer. Our family with the birthday boy. Can’t believe he is three. Although if you ask he will tell you he is “FIVE!” very enthusiastically. 1. Listen to the guest of honor. Follow their lead, and interests. It will be way more fun for everyone. 2. Less is more. 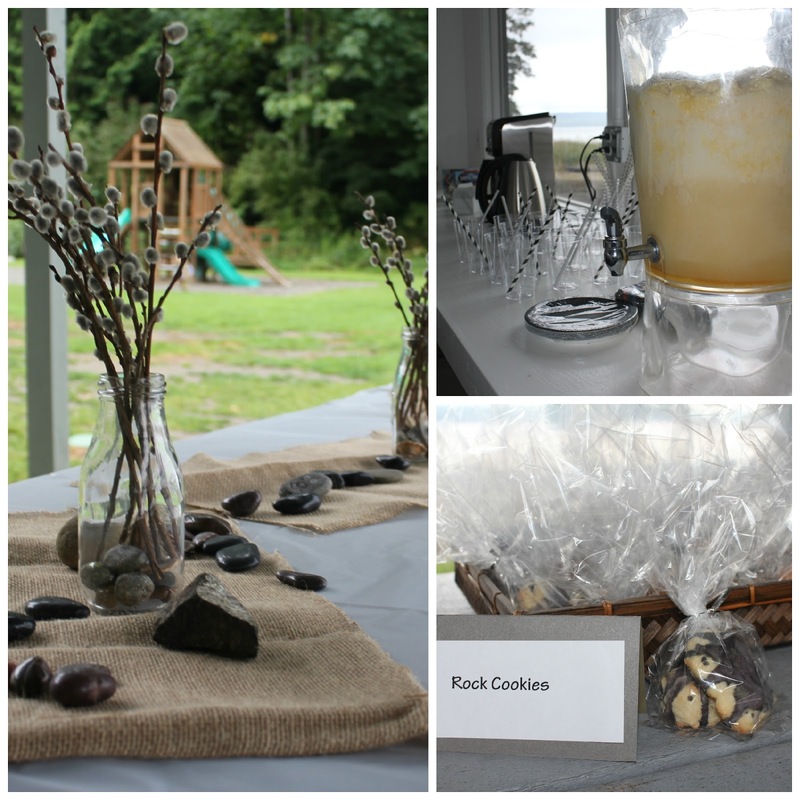 We had this party after lunch and just provided dirt cups and rock cookies (dessert) along with punch. And thanks to a wonderful friend also hot drinks for the adults. 4. My famous punch recipe is always a win! This time I used orange juice concentrate. 6. So the gift thing is always tough for me, I struggle to decide what to do, and people ask me all the time what my opinion is… This year we let people know on the invitations that their “presence was present enough,” but I still allowed Cashel to open and thank his friends who chose to bring gifts. This practice really mirrors our values! I just didn’t place much emphasis on it for the whole group and made sure the giver and Cashel both got to interact while he opened them up. Lots of thanks to those who help our boy learn how to be grateful for your presence, and those who also chose to bless us with presents. I’m learning BOTH are valuable lessons and to take these moments in stride, modeling for our kids what we want to instill in them. 7. Borrow when you can but don’t abuse. So I may be a bit of a culprit of doing this. Borrow items from friends when you can. BUT it recently occurred to me… IF… this is something I use at every party I need to own it myself. And lend as freely as you borrow. Reciprocal relationships are so important to me so why would I not apply that idea in my party planning and execution as well. Maybe you have a friend you always borrow from. Next time ask them if there is something you can purchase and store to lend to them. 😉 Or be sure to write a note and express thanks! This is a shout out to my dear friend Heather who I borrow from all the time. She is a gracious lender and even more wonderful friend. 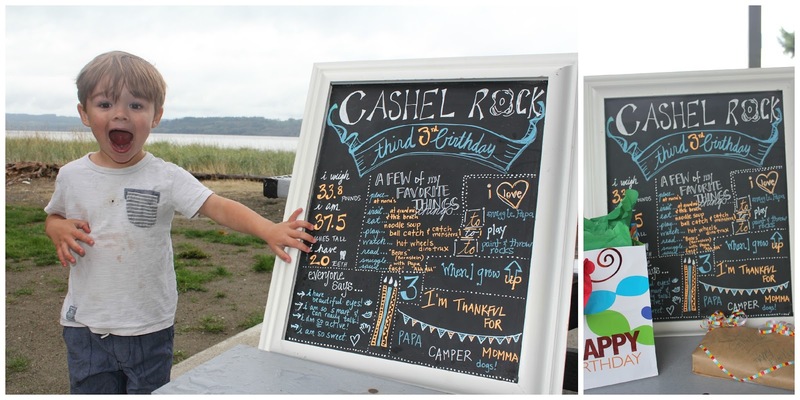 Check out last year’s party – Curious Cashel Turns 2! Follow the recipe below to make easy ROCK COOKIES! Preheat oven to 375 degrees Fahrenheit. Mix all the ingredients together until the dough is well incorporated. Form into rock shaped cookies with clean hands (makes about eight 3-4” cookies). Bake on a greased cookie sheet for 10 minutes or until they begin to brown. Remove from the oven and cool completely. Combine 1 cup powdered sugar, 1 tablespoon milk, 1 drop of black food coloring, and a tiny drop of green food coloring together until you have reached your desired color and consistency…add more powdered sugar or milk if needed. Using a basting brush, paint glaze onto cooled cookies until evenly spread.